World 8- Bowser's Castle is the eleventh and final level of Dark Land in Super Mario Bros. 3, and is the final level in the game. It becomes accessible after the player clears World 8- . The player starts next to a trio of Bowser Statues, which will fire lasers when the player approaches. At the top of a set of stairs is an invisible lift that will start rising when the player steps onto it; if the player misses the lift, they can enter the nearby door and then move left, avoiding Dry Bones, to another door to be brought back to the beginning of the castle to try again. Once the lift reaches its peak, the player will find a Donut Block to the right and must ride it down, jumping off to the right when able before the block falls into the abyss. After passing a Hot Foot, the player will have to jump up stairs lined with three Roto-discs, then fall down the next set of stairs avoiding the same Roto-discs. A 1-Up Mushroom can also be collected at the top of the stairs, next to the wall on the right. Next, the player has to jump across several Donut Block platforms while avoiding Podoboos and falling in the lava below. At the end of this area, the path splits in four ways, with the second from the top path having a power-up and the bottom-most path leading back to the start of the castle. The other two paths lead to Bowser. If the player takes the top path, they will have to jump over four Bowser Statues. Afterward, they must jump across Donut Block platforms while avoiding Bowser's Fire Breath, along with avoiding one more Bowser Statue above. If the player takes the path second from the bottom, they will first have to avoid a sliding Thwomp and ride a Donut Block downward to other platforms they have to jump across, while avoiding a Roto-disc. 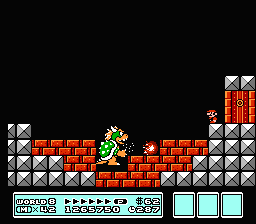 Then the player has to navigate Bowser Statues set up on sets of stairs, and a power-up is placed in the center of this room. After the Bowser Statues are platforms over lava the player has to jump across while avoiding Bowser's Fire Breath and one more Bowser Statue above. The doors at the ends of both of the paths will lead to Bowser's chamber, where the final fight takes place. Bowser attacks by breathing fire at different heights, and the player has to either jump or crouch to avoid them. After blowing two or three fire balls, Bowser will jump into the air and attempt to land on the player. If Bowser lands on the bricks below him, he will destroy them and create a gap. To defeat Bowser, the player has to lure him into landing on the same section three times. If Bowser breaks into the pit below him, he will be defeated and Princess Toadstool will be rescued. This page was last edited on April 11, 2019, at 20:51.